Telesis Preparatory Academy is a kindergarten through twelfth grade school committed to offering curriculum individually designed and delivered to meet the needs of each student in real preparation for lifelong learning. The word “Telesis” (derived from Greek) means “to bring each child to completion through intelligentand planned direction”. We define this as “planned progress”, which is exactly what we do for each of our students – we plan their educational progress. Telesis Preparatory Academy believes the key to students’ success is to have the student work at the level where he or she can be successfully challenged and actively engaged rather than at their frustration level. We want each child to reach and recognize his or her own unique potential, and we will accomplish this by developing an individualized curriculum for each student and placing them in a rigorous and engaging learning environment and situation in which they will have the best potential to be challenged, learn, and succeed. For example, if a 7th Grade student is working at an 8th grade level in reading but a 6th grade level in mathematics, then that student will be placed in a learning environment that addresses and support their skill level, not age or grade level. The Telesis Preparatory Academy staff – administration, instructional, and support – strongly believe in the Telesis Triangle, which represents the partnership we have with students and parents at Telesis Preparatory Academy. In order to plan the progress of each individual student, we believe all stakeholders – the teacher, thestudent, and the parents – join together as a three-member team that works collaboratively to ensure their individual student is receiving a high quality education. 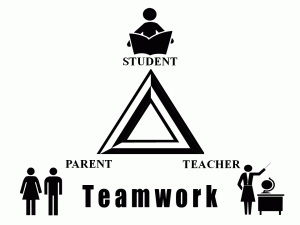 We refer to this as the Telesis Triangle, which represents the partnership our school staff establishes with students and parents at Telesis Preparatory Academy. How to function independently and in groups. How to develop good work habits and attitudes. How all disciplines (science, history, humanities, and the arts, for example) are related. As experienced teachers we also understand the importance of a child’s self-concept, and we know that positive self-esteem will follow when an empathetic teacher or parent helps a child to develop competency, especially in areas where he or she is frustrated and feeling quite incompetent. Students will be in a developmental classroom. This means that if a student is a fourth grader working at a fifth grade level in reading but a third grade level in math, that student will be grouped according to his or her skill level, not grade level. We believe that the key to success is to let the student work at the level where he or she can be challenged successfully, rather than at his or her frustration level.